http://dev.survivalschool.us/wp-content/uploads/2014/06/DSC_0799-1030x682.jpg 682 1030 Sigma 3 Survival https://survivalschool.us/wp-content/uploads/2018/05/inner_header_logo.png Sigma 3 Survival2014-06-15 16:37:162018-06-29 17:26:20SIGMA 3 on new show "America Unplugged"
This debate has been raging since the two ideologies started to become more mainstream more than a decade ago. With increased strife and turmoil in the news, it’s becoming increasingly more important to be well prepared for anything that might happen. It doesn’t matter what you’re prepping for but it does matter how you prep and the way you train. I’ve always said that training trumps gear and I continue to preach that philosophy. The problem with prepping is that you have essentially traded once source of dependence (the grid) for your own source of dependence (your own stockpiles). While I do agree that it is absolutely essential for people to have some basic preps, I also think many people neglected contemplating the fact that what happens if your preps are compromised. The more preps you have the more you have to defend and the less mobile you are. Which makes you an automatic non moving target, i.e. a sitting duck! What if the area you live in must be evacuated because of some disaster or other man made problem. Then what? What does a prepper do when he has to leave his stockpile of preps? And if you don’t have to leave the area, then how do you plan to protect your stockpiles from people who didn’t prepare? Security is the number one issue in a disaster and by having stockpiles you have now become a target for all the friends and family members that know you’re a prepper. They will be showing up on your doorstep and I promise when they haven’t eaten for a week, you saying “no you can’t eat my food”, will not be an acceptable answer to them. And since most people’s idea of prepping is to buy guns and ammo, you had better believe that people will be taking what they want and not asking for it! And that’s just the first wave of people, next will be the criminals and gangs that have been running surveillance on you. What are your plans then? And remember, your own guns will only protect you so long because people will figure out how to beat your static defenses should they become hungry enough. Guaranteed! That is why here a SIGMA 3 Survival School we emphasize that a person, first get themselves some very basic food preps such as 3 months of rice and beans and then begin training their mind instead of hoarding stockpiles of food and ammo. 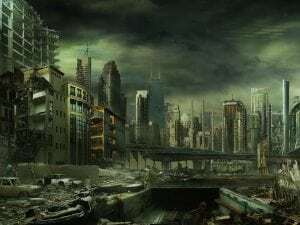 Regardless of what many preppers might believe there is no situation that I can imagine other than the end of the world as we know it (TEOTWAWKI), that you wouldn’t be able to survive from the land having some basic training. Yes much of the larger game and many small game species may be wiped out as a viable food source very quickly if thousands of people had to live off the land out of necessity. But there will never be a lack of the less desirable food sources available in the wilderness such as bugs, rats, wild edibles, fish, etc. Regardless of what happens there will be no lack of these calorie sources. Which makes this the most full proof plan for a food source should you be required to live from them. I honestly don’t think the other more desirable food sources would be wiped out simply because most people are ignorant as to how to get them without all their modern implements and the simple fact that animals get wise extremely quickly to humans hunting them. But even if there are a lack of larger game, then survivalism still wins out over prepping as far as being the most full proof plan for an extended to survival scenario in my humble opinion. For example, one of our primitive survival instructors actually lived off the land for over two years with no modern tools and he did this implementing basket fish traps and foraging techniques. His diet mainly comprised of fish, wild edibles, bugs, and the occasional red meat source. If someone can live off of these techniques for over two years with no modern tools, then surely someone with a full bug out kit as demonstrated in our Diary of Survivalist series can surely live off the land well with a little bit of training. Another bonus to survivalism over prepping is the fact that our survival training brings us closer to the land and helps provide a great sense of appreciation for what we have here on the earth. Through this training it gives you a sense of security that can’t be provided through any other types of training. When you are a well rounded survivalist, you know that no matter what happens that you will always be able to provide for your basic needs of shelter, water, fire, and food. And that personal sense of absolute self reliance with only my greatest tool at my side (my mind), I know that I will be taken care of no matter the circumstances. Prepping just gives me something else to worry about and another way to dump my money down an endless hole of never ending spending. Survivalism costs nearly nothing, whereas most prepping costs a fortune. This is why I incessantly preach that the mind should always take priority to the tangible items that we buy and even if you do have preps then you should first know how to defend them and next know how to replace them should they become compromised. When prepping fails you have to have survivalism as a backup! So buy your rice, beans, and ammo but don’t neglect the most important factor and that is your training! Training is the end all and be all of preparedness and if you train all aspects of staying alive then it doesn’t matter what situation you are thrown into because you know you will be able to survive. But you will only be able to survive with the right mindset and the best training you can get. All things can be accomplished with the right training, so come join SIGMA 3 Survival School and get prepared!